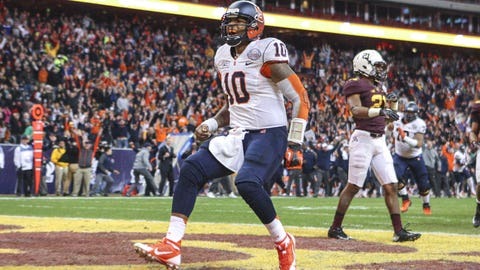 Syracuse QB Terrel Hunt (262 total yards, two TDs vs. Minnesota) scrambled for the game-winning touchdown on Friday, finding the end zone with 1:14 left in the fourth quarter. On Nov. 30, the Orange pulled off their first last-minute victory of the season, the culmination of freshman QB Terrel Hunt hitting Josh Parris on a short touchdown pass with six seconds left. On Friday, a similar script held true for Syracuse, which collected a go-ahead touchdown from Hunt with 74 seconds remaining … and then survived Minnesota’s oh-so-close Hail Mary attempt with four seconds left, after the ball went through the hands of Gophers freshman Drew Wolitarsky near the goal line. With only 11 college starts, Hunt’s statistical variations will swing wildly from week to week. But that developmental process can be expedited … when gamers, like Hunt, are orchestrating game-winning drives in the final moments of crucial games. History will remember Hunt’s 12-yard touchdown run to clinch the Syracuse victory. But the Orange might have never experienced that elation if Estime hadn’t returned a punt 70 yards, kick-starting his team’s final scoring drive. Cobb, the Gophers’ workhorse back, finished with 103 total yards (91 rushing) on 19 touches; but that output is a tad deceiving, since he logged just six carries in the final quarter and zero touches on Minnesota’s final drive. Minus a healthy Jerry Kill roaming the sidelines, of course. Freshman Mitch Leidner, who took over for Philip Nelson in the first quarter, only completed 11 passes against Syracuse. But he might have made believers of Minnesota’s coaches and fans late in the game, tossing a pair of fourth-quarter touchdowns and coming close to a third on the aforementioned near-miss Hail Mary (involving Wolitarsky). It’s a little strange that only four Gophers caught passes against Syracuse, led by Wolitarsky (four catches, 94 yards, one TD) and fellow freshman Maxx Williams (five catches, 76 yards, one TD). But hey, that nugget will likely be embraced in the run-up to a 2014 season that already has Minnesota (8-5, 4-4 in conference play) contending for a West title in the Big Ten — thanks to a realignment plan that has Michigan State, Ohio State, Michigan, Penn State housed in the East division. As in, the freshmen take their lumps today … in hopes of making history tomorrow.